The Perfect Light In The Dark! Create The Most Romantic Memories With Mega Candles! Tired of home décor candles burning fast? Are you a huge fan of lighting candles all around the house? Want to decorate a special event in your life all by yourself? If so, then our unscented candle is here for you. Carefully hand poured and with no repelling scents at all, our pearl pillar candles will accommodate even the most demanding needs. Add A Sleek & Sophisticated Look Around With Our Decorative Mega Candles! If you are looking for high quality, passionate square pillar candles, then you should end your search here. Our ball candles will perfectly match your custom wedding décor as long as it involves something of course. These candles can be used as beautiful additions to receptions, other events of celebrating love, like Valentine's day, an anniversary celebration, or even a themed party. Transform Your House In Less Than An Hour With These Square Pillar Candles! 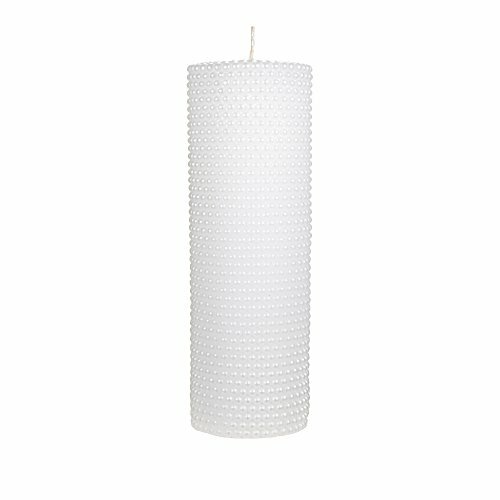 These 3" x 9" round pearl pillar candles have the perfect size to adorn any area around the house. Event planners love them, designers and home decorators do too. Place them on the dinner table, as centerpieces, near flowers, inside the not burning fireplace, over the kitchen counter, in wooden holders and in jars filled with rocks or even coffee beans. The options are endless. All you need to do, is to get yourself this cool candle, explore your home and unleash your imagination! COMPLIMENT EVERY ROOM: Looking for ways to improve your home décor without having to spend a small fortune? Probable searching for our candles, right? With these passionate decorative pearl pillar candles, you can decorate and add warmth to your house in seconds. BURN FOR UP TO 20 HOURS: Forget all those decorative candles that would burn out in just a few hours and enjoy long lasting candle burning! The cotton wick ensures up to 60 hours of consecutive burning. FIT EVERYWHERE YOU WANT: Their generous size 3" x 9" round pearl pillar candles makes them ideal for all kinds of decorations and even arts and crafts. They are not way too small, but not bulky either. Put some in the study room, on the floor, TV set, kitchen countertop or your bathroom. DECORATE ANY SPECIAL OCCASION: These round pearl pillar candles are ideal for all your special events and ceremonies. Perfect for wedding receptions, birthday parties, baby showers, use as party favors, table centrepieces, window décor and so many other uses. HAND POURED CANDLE : All of the candles are meticulously handmade with love and passion. Place them in bowls with water, tall glass vessels, around flowers, in jars with pebbles, over antique trays or on the stairs!